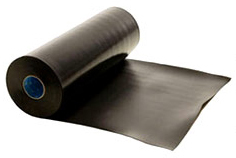 Non-woven, flexible PVC material that protects pipe coatings from direct impact during backfilling operations. Allows water to drain away. during operation of the line. Cans withstand temperatures of 350°F (414°C). Tear strength of 15 lb./inch. Does not inhibit cathodic protection. Choose from pads or rolls. Designed for use where bond to the anticorrosion coating is not required. Used as a rockshield over recoated pipe and applied in a cigarette wrap fashion using renwrap tie-down tape . Cab be applied in temperatures as low as – 30°F (-34°C) or as high as 160°F (71°C). Heat-shrinkable wraparound sleeves designed for corrosion protection of girthwelds on buried pipelines. Easy installation – the sleeve is wrapped around clean preheated pipe and a flexible closure forms the sleeve into a tube; the sleeve is the torch-shrunk around the pipe . Compatible with all standard pipe coating and outer jackets. Repair systems for damaged mill-applied PE coating.